The archives of Brooklyn Daily Eagle, which are hosted by the Brooklyn Public Library, are a treasure trove of historical snapshots into the history of cycling in the borough. After reading a few articles–and there are hundreds to comb through–my big impression was that the more things change, the more they stay the same. The police have grown tired of complaints from non wheeling citizens who allege that the silent steed is a menace to the comfort, health and bones of innocent and peace loving pedestrians. Within the last two weeks a dozen letters have been received at police headquarters from indignant persons who represented that of late wheelmen were indiscretely riding at night through the main thoroughfares at a rapid rate without the warning lamp, and instances were given where men, women and children had been mowed down on Flatbush and Bedford avenues by the noiseless two wheeler. “A dozen letters…from indignant persons…” Why, that’s almost as many people who belong to Neighbors for Better Bike Lanes! 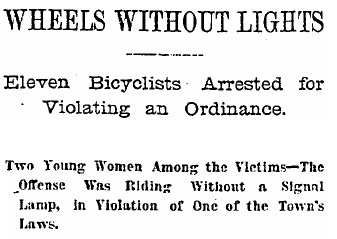 In all seriousness, as a bike blogger I am no more in favor of bikes riding without lights at night in 2011 as I would have been as a pamphleteer in 1892. But it is interesting to see an old paper using terms such as menace and mowed down in a story on cycling. It’s as if reporters have been pulling from the same filled-in Mad Libs style guide for nearly 120 years. On November 6, 1890 a general order was sent out from police headquarters calling attention to the ordinance…and demanding enforcement. Several arrests were made, and for a time wheelmen obeyed the law. They became careless again, and so did the police. On June 13, 1891, the superintendent again asked the force to see that the law was obeyed, and again there was some show of attention on the part of wheelmen. The craze for bicycle riding has recently become pronounced and of late the practice of tearing through the streets at racing speed has been entirely too common. Yesterday afternoon Inspector MacKellar again sent out a warning to his men to enforce the ordinance, and details were sent from the Fourth, Tenth, Sixteenth, and Twenty-second precincts to make arrests for violations. Change 1890 and 1891 with 2010 and 2011 and this article could be written today, since the most recent police “crackdown” on cycling was in October and another one is set to begin any day now. If history is any guide, the behavior will change for a bit, until it goes back to the way it was, giving us a lot of evidence that ticket blitzes and crackdowns alone are not enough to engender change. From a 21st century perspective, only infrastructure can do the job. =v= Wow, these are awesome. I’d love to pore through back issues of the Eagle sometime. The Times has an impressive archive online, with some great, positive stories about wheelmen (and wheelwomen) back in the day, particularly in Brooklyn. Right around the turn of the century, though, there was a shift in editorial policy and they started printing attacks against “scorchers” who were biking too fast and running down widows and orphans.